Written by Charles on October 30, 2018 in Blog. From tiki drinks with paper umbrellas to high-rise resorts with man-made waterfalls, vacationing on Maui can occasionally feel, well, artificial. 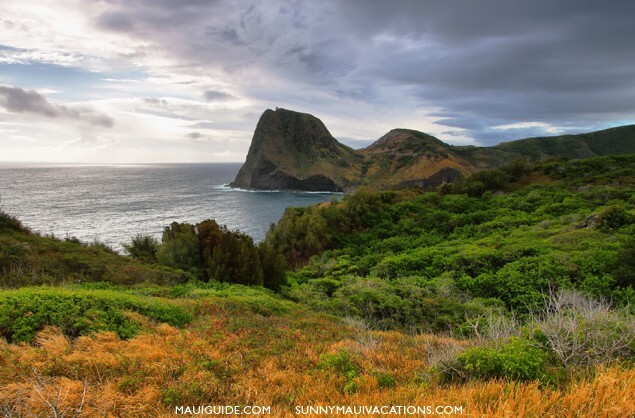 Wailuku may be the county seat, but, with the exception of day trips to ‘Iao Valley State Park, much of Maui’s central region tends to be overlooked. It’s a shame, too, given that this terrain — lush, lovely, and calming — once served as the hubbub of agriculture and commerce. Now, the less-touristy streets, restaurants, and sights offer a more authentic glimpse into old Hawaii. One such part of the central isthmus is Mendes Ranch. Located past Wailuku on the way towards the island’s northwestern tip (and directly across the way from the Waihe’e Ridge trailhead), Mendes Ranch harkens back to an era when much of the island was left unspoiled. 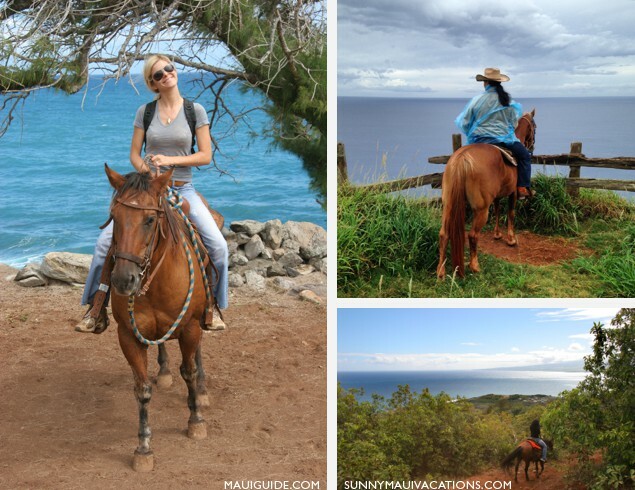 To this day, acres of undeveloped, windswept land give way to stunning views of the coastline, and equally stunning views of the West Maui Mountains. Founded in 1886 when the Mendes ‘ohana came to Maui from the Azores in Portugal, the ranch was led by the Mendes patriarch, Manuel “Red,” and his only son, Ernest. Today, visitors can absorb the gorgeous setting astride horses on morning or afternoon tours, which take them down the picturesque valley to the Pacific; go for the latter if you want to partake in a meal that’s pure paniolo. 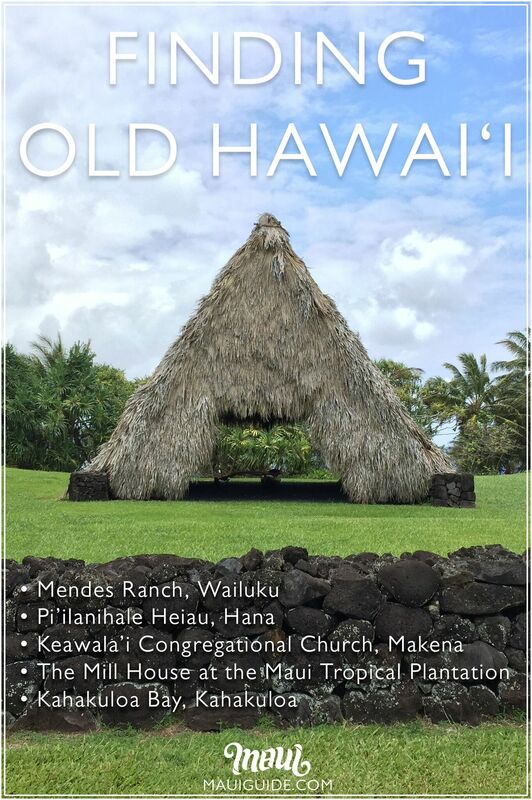 Heiau were and remain an imperative part of Hawaii; a place to worship, celebrate, and pray. Constructed with a variety of materials in a myriad of ways—from simple stone markers to fishing shrines built underwater—they served as sites to ask for health, peace, and success. Some were reserved for ali’i (royalty); others were used by the masses. But all had one thing in the common: They were a mainstay of the native culture. Many across the islands were destroyed upon the arrival of Christian missionaries; others simply fell into disrepair. But one heiau, along the Road to Hana, was lovingly and diligently preserved: the Pi’ilanihale Heiau in Hana’s Kahanu Garden. 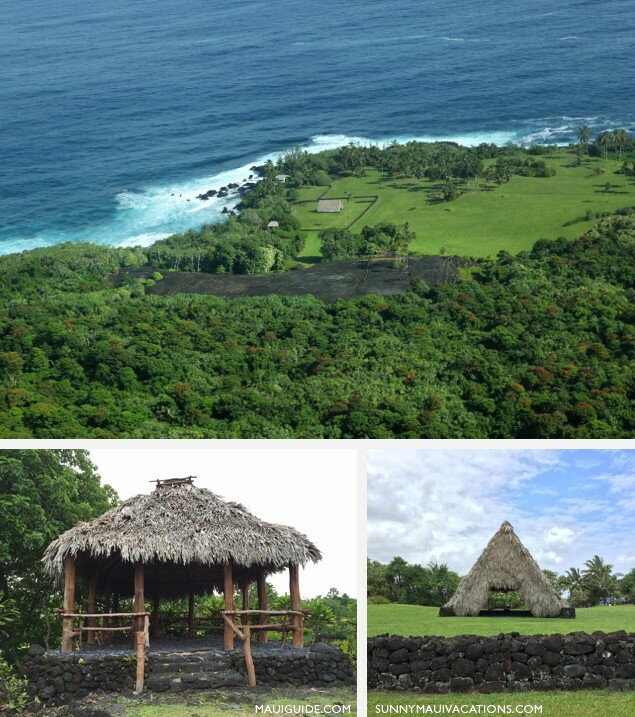 Believed to be the largest existing heiau not only in Hawaii but also all of Polynesia, the enormous structure, started in the 13th century and fabricated in several phases, possesses a three-acre platform with fifty-foot retaining walls. Mana is palpable here, while the surrounding gardens—containing one of the world’s largest copses of breadfruit—add to the site’s mix of poignancy and magic. Reverend “Kahu” Alika likes to tell the story when, in the early 19th century, the new steeple of the church he’s now presided over for thirty-plus years was once seen—and celebrated—from Kaupo (that’s how quiet the island once was). 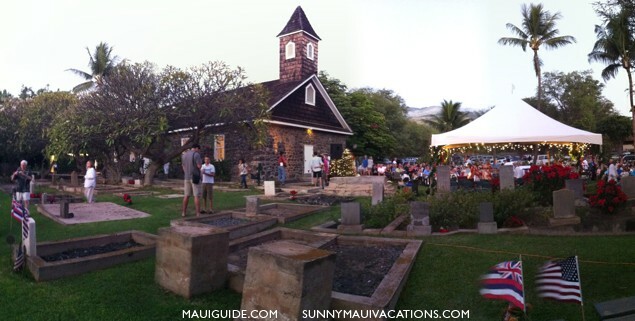 Not far from Makena Beach, journey to the small, stone-wood chapel on Maui’s southside and you can easily picture it. Founded in 1832 as the Church of Honua’ula (Honua’ula is the ahupua’a upon which it rests), Keawala’i — originally constructed of pili grass — has weathered immense changes since its erection. Drought, the Great Depression, World War II, neglect, thievery—all had an impact on the church and its coterie of parishioners. But what has remained is its beautiful Hawaiian spirit and its mission to welcome all, love all, and accept all into their ‘ohana. Today, two Sunday services are offered to kama’aina and visitors alike, while same-gender marriages are performed by Kahu. From the graves of ancient Hawaiians to the perennially-flourishing plumeria and gentle Makena waters, the quietude of old Maui persists on these pristine grounds, making it difficult to leave. Waikapu — a verdant village at the foot of the West Maui Mountains — may be one of the serener regions on Maui today but it was once a thriving community. Fed by the waters of Wailuku, Waikapu, Waihee, and Waiehu, kalo (aka “taro”) flourished on its land, so much so it housed the largest continuous kalo field in Hawaii. Ali’i used the location as a lookout and refuge, while the enclave itself operated as one of the island’s political centers. In the 19th century, the fertile land began to be cultivated for sugar, pineapple, and coffee, eventually accommodating the Waikapu Sugar Plantation. Modest homes and camps catered to the droves of plantation workers who arrived from as far away as Portugal and China, and, in 1929, an airport was built on the coastal edge in Maalaea. When sugar production increased, the Cornwell Mill in Waikapu closed, and in 1984, Maui Tropical Plantation — a working plantation featuring more than 40 crops — opened to the public, showcasing the flowers, fruits, vegetables, and herbs of Hawaii. When news arrived that the nearby Wailuku Mill would be closing, Maui Tropical Plantation took it upon themselves to preserve and honor this vital part of the island’s heritage. Pieces that ranged from gears to flywheels were salvaged from the mill and used as tributes and displays across the plantation’s property. 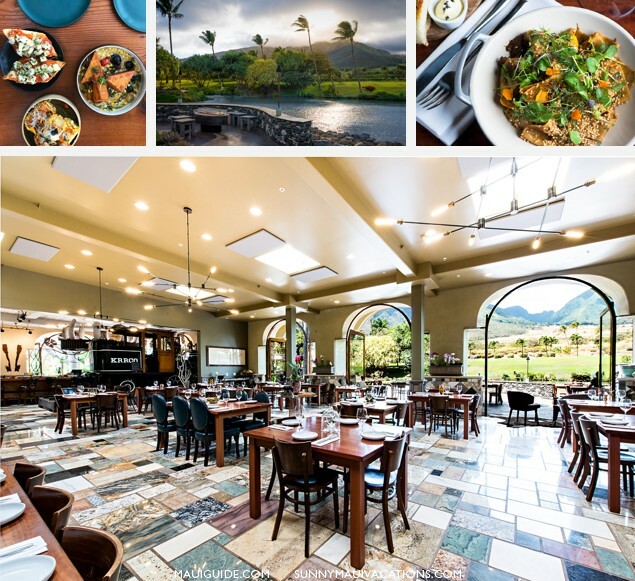 Look to the mountains and you’ll find an untarnished beauty that’s straight-up rare in modern day Hawaii; dine at The Mill House and you’ll get that taste of old Hawaii. Ka’anapali is globally known for presenting what outsiders expect of Hawaii: luxe hotels, leggy palms, buzzy restaurants, immaculate golf courses, and a dazzling beach filled with sunbathers, snorkelers, and stand-up paddlers. But drive past the first master-planned resort community in the Aloha State and a different side of Hawaii unfolds: Vast, unpopulated bays marked by massive swells; miles of barren, rugged coastline; astonishing views of the open ocean; and empty, verdant slopes unperturbed by development, with noni, ti, and palm groves. An area once reserved for coffee and pineapple, the route on Kahekili Highway — named after Maui’s last and legendary chief — turns narrow and rough the closer you get to the “head” of the island. Before the path loops around, taking you to the Mendes Ranch that opens this post, you’ll come across a blink-and-you’ll-miss-it hamlet known as Kahakuloa. Think Bolinas pre-gentrification or Bodega Bay of the bygone days (both charming towns just north of San Francisco). This whole, albeit tiny fishing village holds little more than two churches, an art gallery, local residences, small businesses, a sculpture garden, and stands for banana bread (for which the region is famous). The silence here is so rich it has its own feel and taste. Order a chocolate-dipped banana from Aunt Julia and sit in front of her homestead, where between the ample trees you can see a peek of the impossibly-blue ocean. Tranquil, steeped in history (there’s a reason why Kahakuloa’s 636-foot hill was dubbed “Kahekili’s Leap”), this was once a sanctuary where Hawaiians were considered shielded by the gods from the laws created by royalty. Divine it is — and, like Hawaii, remarkably special.